The Little Lilypad is a lifestyle blog mostly written by a mum to two beautiful, cheeky and entertaining daughters. It is sometimes written by the Man on the Pad or by one of our baby bloggers. Occasionally we accept guest posts too. There is frequently talk of shoes and clothing (we love fashion and savvy shopping), chocolate (who doesn't love chocolate) education and swimming (we love this too). It is hopefully helpful, sometimes funny and always honest. Step into your life, not around it. If you ask most women who inspires them, some will say an entreprenuer, some will say a famous name and some will simply say their mum. The common theme in almost all of these replies will be women and its clear that women have always inspired other women, so I was delighted and honoured to be nominated for a Women Inspiring Women Award with Damsels in Success. The event was organised by Lucie Bradbury, the founder of Damsels in Success and whose enthusiasm is infectious. I recently tweeted that Lucie speaks with genuine belief and sincerity and even if you dont "buy into" the Damsels ethos, you cant help but feel her enthusiasm and determination. The room was filled full of hard working, focused, driven, entertaining (and some nervous) women and whilst the evening was about women, I couldnt help but be captivated by our host for the evening, Richard Wilkins. His mantra is "if you have no money, you're broke, if you have no energy, you're dead" and this is from the man who, in his own words, "lost a fortune and got a life". The evening sparkled with energy and his contribution to the evening fuelled this even further. 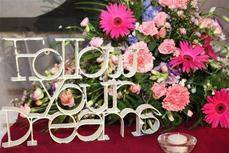 Sometimes life can get in the way of your focus and whatever it is that makes you follow your dreams, whether it be a life coach, a networking group, an evening full of inspiring women, its your life and your choices, so do it, be it, live it, love it.